NEW ORLEANS, La. 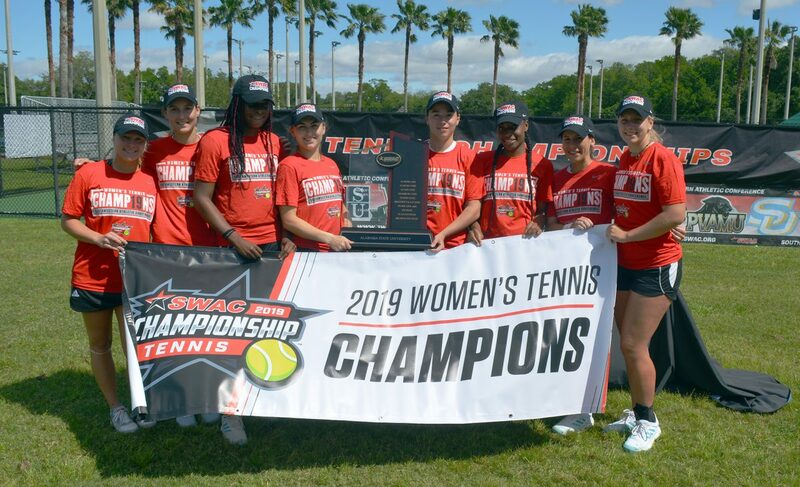 | Alabama State blanked Alcorn State 4-0 at the Pepsi Tennis Center Sunday morning to claim their third consecutive Southwestern Athletic Conference (SWAC) championship, and earn the automatic bid to the NCAA Championships. Alabama State took control of the match early by winning doubles point with wins at number one and three doubles, before they were able to win three singles matches in straight sets to claim the victory. Gabriela Lackova claimed a 6-2, 6-0 victory at number four singles, before the two major award winners – Reka Szentes (Player of the Year) and Urska Velec (Freshman of the Year) – each picked up wins at numbers one and five respectively. Maria Popova was named the Tournament MVP, and Anuk Christiansz was named the Coach of the Year after the win by the Lady Hornets; while Szentes and Velec each were named All-Tournament. Alabama State will find out their opponent and destination on the NCAA Selection Show April 29.